Thursday 26 January sees the return of Polish-born, New York based artist Olek to Tony's Gallery in East London, for her first UK solo exhibition entitled "“I do not expect to be a mother but I do expect to die alone”. We last saw Olek back in November when she was working on an installation outside Tony's Gallery on Sclater Street. 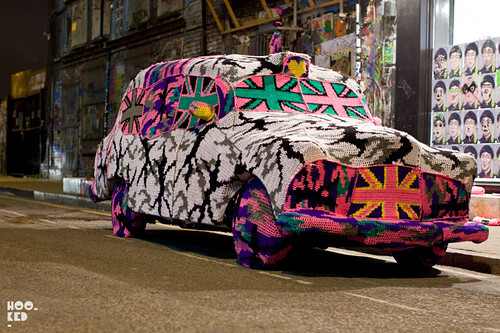 The artist spent two days wrapping an entire London Black Cab wheels and all in crocheted yarn featuring her signature camouflage print with the addition of some union jack's much to the delight of the passing public. For this solo exhibition, Olek has drawn inspiration from her experiences of living in the UK and has spent the last month creating a major installation and sculptural environment within the gallery space. The interior of the space will be transformed with the gallery walls and floor covered entirely in crochet as well as featuring a distinctive Olek-esque living quarters filled with domestic objects of all kinds! The exhibition opens with a private view Thursday 26 January, 6-9pm and the show will run until the 23 March 2012. Tony's Gallery - 68 Sclater Street - London. I love the last Olek exhibition at the Tony's gallery, great fun and great work! her crocheted London black cab, a piece produced outside of Tony's in November.